Phoenix's Raffi Torres was suspended indefinitely following Tuesday night's hit on Chicago Blackhawks forward Marian Hossa. Torres faces a Friday hearing with NHL officials in New York. The hearing was planned for Wednesday but was deferred at the request of the player and NHL Players' Association. Hossa was struck by Torres' shoulder in the first period of Game 3 of the Hawks' opening-round playoff series. He was rushed off the ice on a stretcher and taken to Northwestern Memorial Hospital. 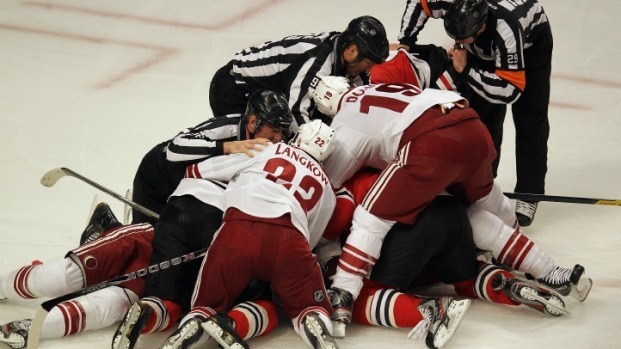 The Coyotes went on to win Tuesday in overtime and now lead the series 2-1. Blackhawks physician Dr. Michael Terry said Hossa left the hospital late Tuesday night and was being monitored at home. But there were several scary moments as Hossa laid motionless on the ice. After watching Marian Hossa hit by Raffi Torres and taken off the ice on a stretcher, Joel Quenneville, Jonathan Toews and Brent Seabrook react after Game 3. "Brutal hit. I saw the whole play," Coach Joel Quenneville told NBC Sports during the game. "One hundred miles an hour, no puck, intended hit head to head. It was a brutal hit. I can't believe four guys missed it." Hossa, who led the Blackhawks with 77 points this season, was ruled out for play in Game 4. The team has not said if he'll return for the remainder of the season. Last season, in Game 3 of the first-round series, Torres delivered a hard hit to Brent Seabrook that injured the Chicago defenseman. On Tuesday the NHL handed a three-game suspension to Blackhawks winger Andrew Shaw for his collision with Coyotes Goalie Mike Smith over the weekend.